World War II French Jewish spy Marthe Cohn will speak in the Great Hall of Krannert Center for the Performing Arts at 6 p.m. Feb. 13. 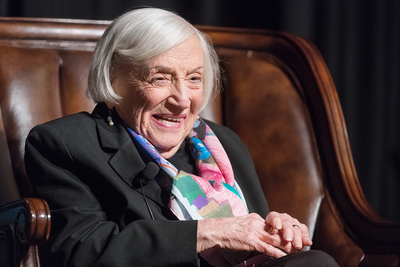 CHAMPAIGN, Ill. — World War II spy Marthe Cohn will speak on campus Feb. 13. The author of “Behind Enemy Lines: The True Story of a French Jewish Spy in Nazi Germany,” Cohn will share her story of joining the French intelligence service, posing as a nurse, crossing enemy lines and relaying information about the Nazis back to the French. The French government honored Cohn with both the Croix de Guerre, awarded to people who distinguished themselves in the Allied fight against the Axis forces, and the Medaille militaire, given for bravery in action against an enemy force. Cohn will speak in the Great Hall of Krannert Center for the Performing Arts at 6 p.m. Feb. 13. After the event, Cohn will autograph copies of her book, which will be available for purchase at the venue. The event is co-sponsored by the Chabad Jewish Center and is free and open to the public.